All current users of the app are listed on the ‘Users‘ page in the System Settings > Setup area. This is also where you add new users, set up their login details and, if on a subscription that supports it, identify the user’s roles. Bear in mind that you need to set the number of allowed users on the Subscriptions page. To add additional users to your subscription simply click the ‘Add New User’ button on the ‘Users‘ page. Add the new user’s name and email details and click ‘Save’. For the password you have two options. You can either set a random password and tell the user to use the ‘Forgot your password’ link to reset this to a password of their choice, or set a predetermined password. If you’re on one of our subscriptions that supports User Roles, you can control each user’s access to different parts of the app, by assigning them roles in the app and setting up permissions for those roles. Doing this will make using the app simpler for each user, as they will only see and be able to access the parts of the app that are relevant to them and their role. Setting up some access as ‘read only’ will also prevent a user mistakenly editing or deleting something they should really only be looking at. 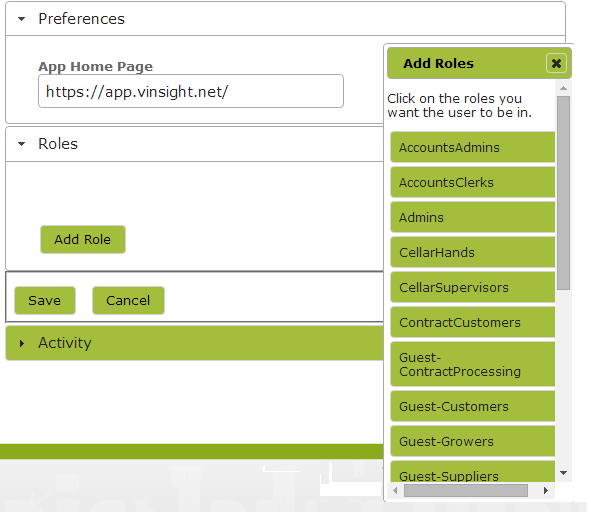 In the ‘Roles’ area, click the ‘Add Role’ button, select all roles that apply from the drop down menu and click ‘Save’. Ensure that the home page you set for them is a page you want them to see. 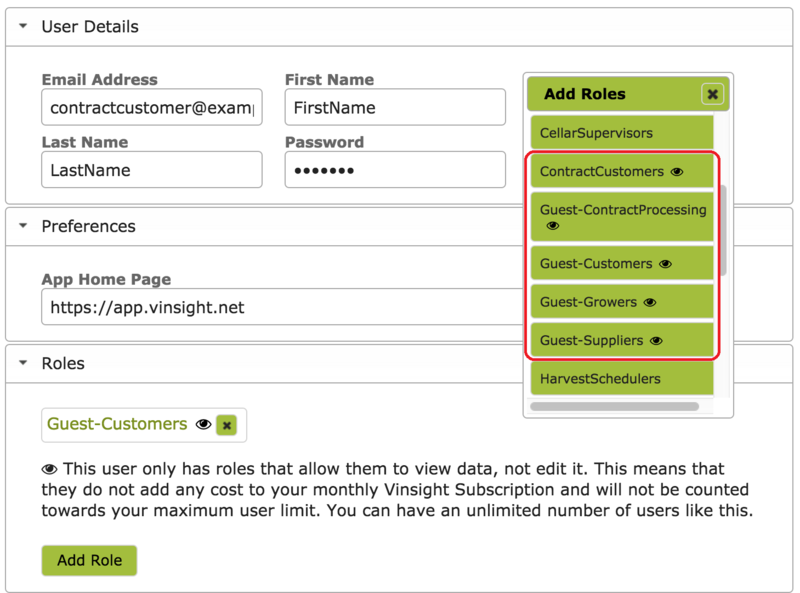 For example, you may be happy for your Sales Reps to go to the Sales Dashboard, “https://app.vinsight.net/Dashboards/Sales”, whereas you may want an Inventory Administrator to go straight to the Stock Items page “https://app.vinsight.net/StockItems”. Edit this in the ‘Preferences’ -> ‘App Home Page’ area of the user page. Click the ‘assign some default permissions’ link to add the default permissions, enabling the Sales Rep full access to the Contacts, Sales Orders and StockItemAllocations, as well as read only access to several other areas of the App, such as TaxRates and StockItems. You can view these permissions by clicking on the ‘SalesReps’ link (see red arrow in above image). 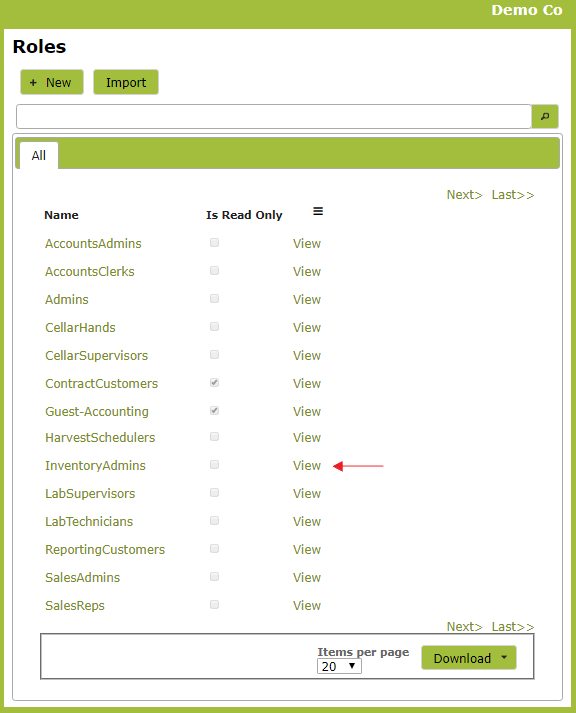 Alternatively click on ‘User Roles‘ in the Settings > Setup area and select ‘SalesReps’ from the list. Default Sales Rep permissions are shown below. These permissions can be edited as you require. 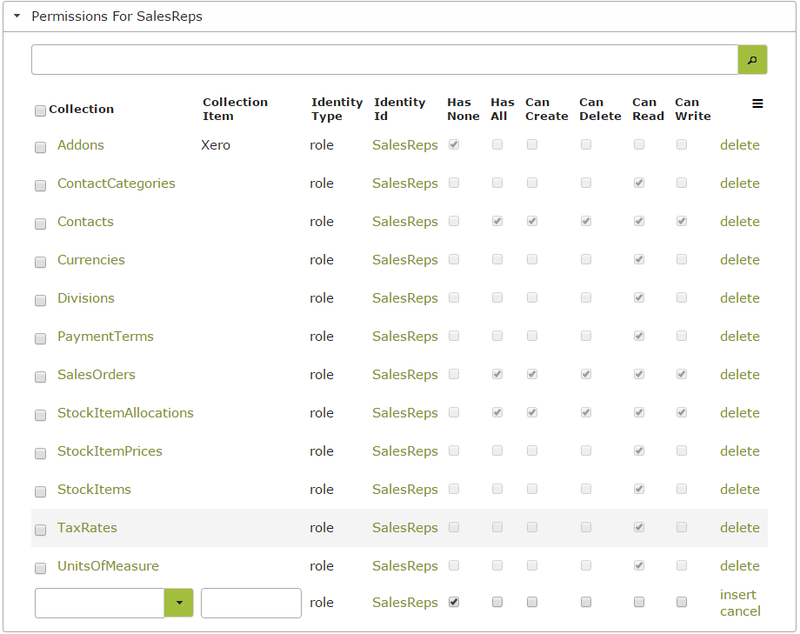 Note that if you edit the SalesRep permissions, these changes will apply to all users with that role. If one of your SalesReps additionally has some other role within your organization, you should to add another role to that user, rather than edit the SalesRep role to accommodate the particular rep. That way other SalesReps will not be affected. Other Roles do not have default permissions set up. If this is the first time you are adding a User, you will need to set the permissions and access for the role added. You will only need to do this once. After you have defined the permissions and access for a particular role, any new user assigned that role will automatically get the associated permissions. To set the permissions for a new role, go to the ‘User Roles’ in the System Settings area. Select the role you wish to edit by clicking the name itself or the ‘view’ link next to it. 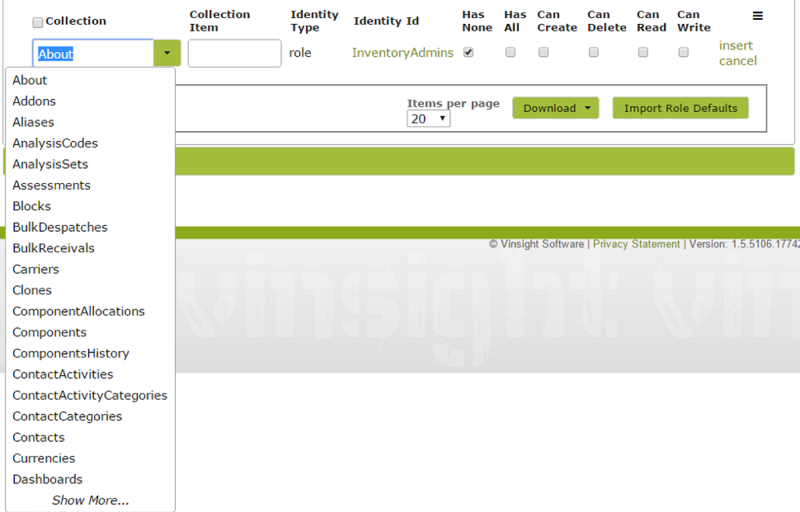 For example clicking on InventoryAdmins will bring up the InventoryAdmins role page. In the image below, this role currently has no permissions set. All possible permissions are listed in the ‘Collection’ drop down menu. To add permissions to this role, select relevant categories from the Collection drop down menu and add one at a time. There are certain permissions that all users will need simply to be able to login in, namely ‘Divisions’ and ‘Subscriptions’. Make sure you give each role at least a ‘read’ access to these parts of the app. Do this by selecting ‘Divisions’ from the ‘Collection’ drop down list, ticking the ‘Can Read’ checkbox and clicking insert at the end of the line. Do the same for ‘Subscriptions’. However, while some permissions will appear obvious, others will not. The easiest way to work out exactly which permissions the user/role will need, is to log in as the new user and attempt to use the app. (See Tip below.) If the necessary permissions are not set, the user will soon encounter pop up warnings, which will give you some guidance as to the permissions required. Tip: If you wish to login as both the administrator and another user on the same computer at the same time, try doing it in different browsers, e.g. login as the administrator on Chrome and the user on Firefox. Then switch between windows editing permissions on the administrator’s window and testing them in the users’s window. If using Chrome, another option is to first login as the administrator, then open a new ‘incognito’ window by right-clicking on the ‘Chrome’ icon and selecting ‘New incognito window’. Login as the user in the incognito window. Either of these methods will enable you to be logged in as two different users on the same computer. For example, you may have given your Inventory Administrator permission to create, edit, read and write ‘Stock Items’, but not have given them permissions to other areas of the app they will need to access, in order to create a new Stock Item. If so, when you login as the Inventory Adminstrator and attempt to create a new Stock Item, you will receive pop up warnings similar to this. Such warnings should provide a clue as to which permissions are missing. The above message indicates that to create a Stock Item a user will need to have permissions to access the ProductGroups endpoint. Similarly the following message indicates that access to the StockGroups endpoint is required to create a Stock Item. Both these issues can be easily fixed by providing the InventoryAdmins role with at least a read access to “ProductGroups’ and “StockGroups” on the permissions page. Use these pop up warnings as guides to ensure you have the correct permissions set. 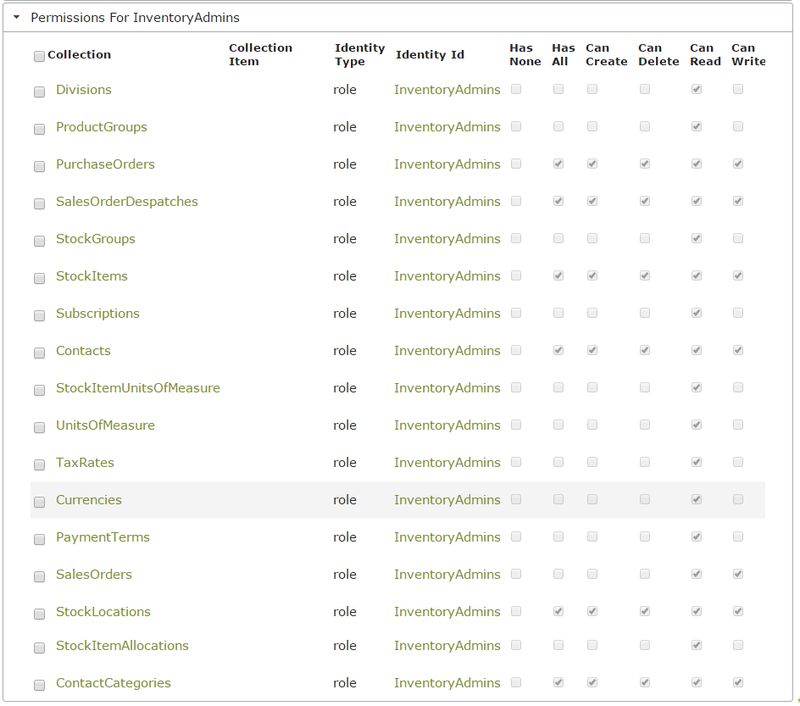 Below is an example of a set of permissions for an Inventory Administrators role. These permissions enable the Inventory Administrator to add and delete stock items, create purchase orders to order in new stock, read and write to sales orders to despatch stock, and create and delete contacts. Obviously your permissions for such a role may vary from this depending on the particular tasks encompassed in that role within your organization. The Roles with the little ‘eye’ next to them are all guest ‘read only’ roles. 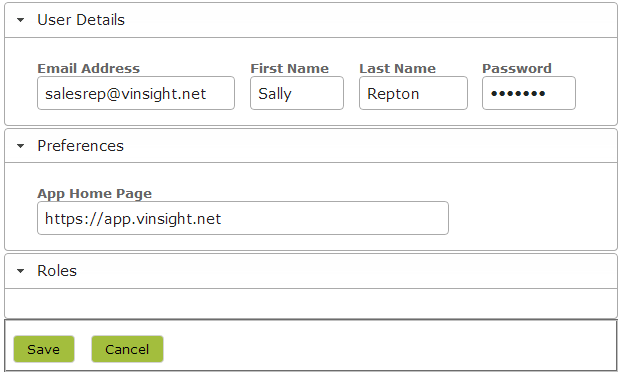 Once added, all guest users will be listed in the ‘Non-Billable’ tab on your Users page. To change a users’ login email, you will need to delete the user with the current email address and add in a new user with the new email. 1. Click on the user requiring the change and make a note of the preferred home page (e.g. Dashboard/Sales) and roles (e.g. Sales-Rep). 3. Add a new user with the new email address by clicking the ‘Add New User’ button and completing the form (putting in a temporary password). 4. The can then log in with the new email and use the ‘Forgot your password’ link to reset their password.